At last night's FairTax strategy meeting in NJ Herman Cain, & especially his recent debate winning performance, received much attention & discussion. I reminded several people in attendance of the very popular posting on ReturnToExcellence.net on July 3, 2010 where an old marine spontaneously sang the fourth verse of the National Anthem. Many did not notice then that the song was sung @ a Herman Cain Tea Party meeting. I repeat below the original posting & hope that everyone will do their own study re Mr. Cain - when you are convinced he is for real back him with all of your might. I know that Carol & I are. Thanks to a subscriber to ReturnToExcellence.net for sending us this link to a video of a Tea Party meeting with the great Herman Cain taking a question from a man who refers to himself as a former Marine. The result is inspirational as all of Mr. Cain's events are. In this case it brings in the fourth verse of the National Anthem. The Marine made a mistake though in referring to himself as a former Marine - I have never met a former Marine or an ex-Marine. I have met old Marines. Click here to listen to Herman Cain respond to Chris Wallace's question about the FairTax @ the first televised presidential primary debate last night. Mr. Cain is another eloquent speaker - in the Luntz focus group after the debate the 29 SC panelists overwhelmingly said that Mr. Cain won the debate & their support. This illustrates how the FairTax will be passed into law - presidential candidates educating millions of people about the FairTax during the debates & then one of them winning the presidency. I recall that after President Reagan won the presidency that Congress was so overwhelmed by the mandate to enact Reagonomics that they were sitting on the steps in the House correcting in pencil typographical errors in the written legislation. The FairTax needs such a champion. 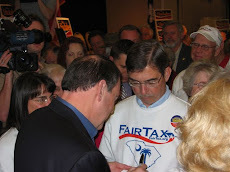 On a negative note the enemies of the FairTax are still many. 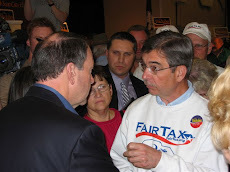 Sean Hannity interviewed Mr. Cain after the debate & asked him questions about everything except the FairTax & you know why.